Go ahead, indulge yourself. 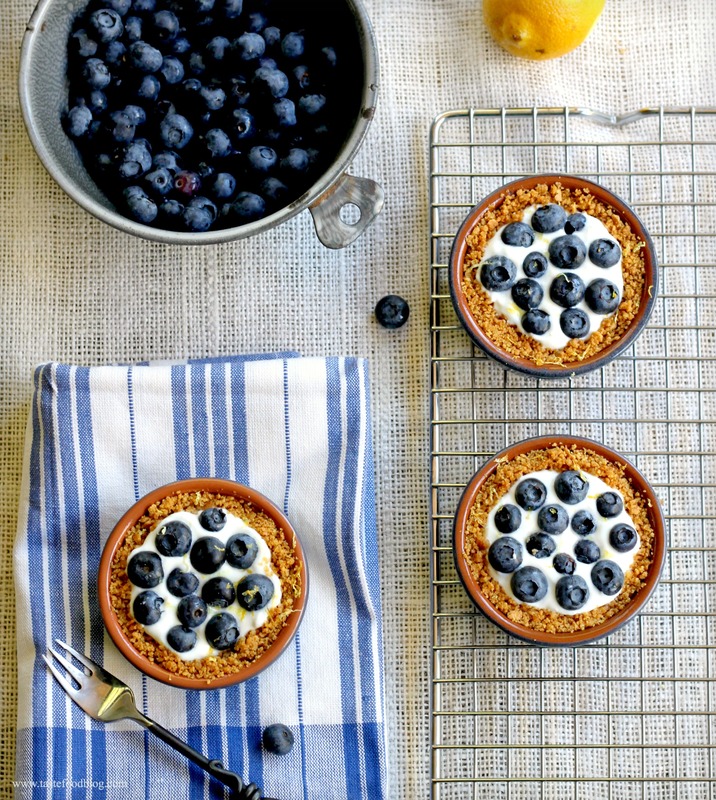 These gorgeous blueberry tartlets are rich and creamy, fragrant with lemon, bursting with fruit and not-too-decadent. Why? The luscious filling is 100 percent yogurt, not cream cheese or mascarpone. The trick is to choose a full fat Greek-style yogurt. It’s thick and silky, with a tang that perfectly offsets mellow, inky blueberries. The crust is a traditional graham cracker crust, which, yes, has brown sugar and butter (as any self respecting graham cracker crust should). So these tarts are just a little bit wicked, but it’s a dessert after all, and what’s wrong with being a little wicked anyway? Heat oven to 350°F (180°C). Combine the graham crackers, sugar, cinnamon and salt in the bowl of a food processor. Process until crumbly. Add butter and pulse until the crust is blended and beginning to stick. If using a tart pan, dump the crumbs into a 10-inch tart pan, pressing with fingers evenly over the bottom and up the sides. If using individual tart dishes or ramekins, divide the crumbs between 6 to 8 ramekins and press the crumbs evenly over the bottoms and up the sides. Transfer to a baking sheet. Bake in oven until crust begins to turn golden brown, 10 to 12 minutes. Remove and cool completely on a rack. While the crust is cooling, whisk the yogurt, sugar and lemon zest in a bowl. Pour the yogurt into the cooled crust, smoothing the top. Dot the yogurt with blueberries. Garnish with lemon zest. Refrigerate until serving, up to 4 hours. my kind of recipe all the way, and I would be ready to indulge! Just luxurious! 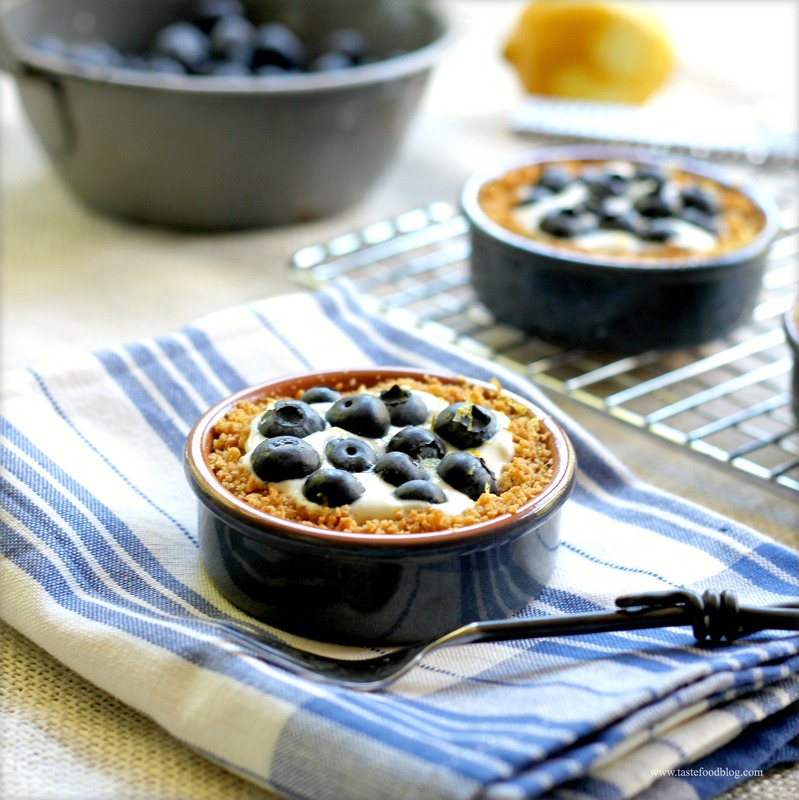 My husband adores blueberries and would be smitten with these inspired tartlets! I just received a Greek yogurt maker for my birthday, a great time to try your recipe. A greek yogurt maker! Sounds divine. They look so yum! Photos are just gorgeous! Divine and fresh! A wonderful recipe. I actually have everything I need for these beauties in my fridge right now….YIPPEE! They look like a wonderful treat to me.